Then read each question and its possible answers carefully. Re-read the relevant parts of the passage to see which answer is best supported by the text. (Make sure it is not only correct according to the text, but actually answers the question.) Write down the letter which gives the best answer for each question. Then check the answers (and brief explanations) at the bottom of the page. How many did you get correct? If you would like to print this exercise and work offline, click here for a downloadable pdf. 1.The United States which fought the Civil War was vastly different from the United States which fronted the world at the close of the Revolution. The scant four million people of 1790 had grown to thirty-one and a half million. This growth had come chiefly by natural increase, but also by immigration, conquest, and annexation. 2.Settlement had reached the Pacific Ocean, though there were great stretches of almost uninhabited territory between the settlements on the Pacific and those just beyond the Mississippi. 3.The cotton gin had turned the whole South toward the cultivation of cotton, though some States were better fitted for mixed farming, and their devotion to cotton meant loss in the end as subsequent events have proved. The South was not manufacturing any considerable proportion of the cotton it grew, but the textile industry was flourishing in New England. A whole series of machines similar to those used in Great Britain, but not identical, had been invented in America. American mills paid higher wages than British and in quantity production were far ahead of .the British mills, in proportion to hands employed, which meant being ahead of the rest of the world. 4.Wages in America, measured by the world standard, were high, though as expressed in money, they seem low now. They were conditioned by the supply of free land, or land that was practically free. The wages paid were necessarily high enough to attract laborers from the soil which they might easily own if they chose. There was no fixed laboring class. The boy or girl in a textile mill often worked only a few years to save money, buy a farm, or to enter some business or profession. 6.Thus far had the nation progressed in invention and industry along the lines of peaceful development. But with the Civil War came a sudden and tremendous advance. No result of the Civil War, political or social, has more profoundly affected American life than the application to the farm, as a war necessity, of machinery on a great scale. So long as labor was plentiful and cheap, only a comparatively few farmers could be interested in expensive machinery, but when the war called the young men away the worried farmers gladly turned to the new machines and found that they were able not only to feed the Union, but also to export immense quantities of wheat to Europe, even during the war. Suddenly the West leaped into great prosperity. And long centuries of economic and social development were spanned within a few decades. A. The U.S. has always been the world leader in industry. B. The U.S. grew the cotton as well as making cloth from it. C. Britain was by far the most industrialized nation of the world. D. American wages were high by world standards. A. Wages in America were high compared to other countries at the time. B. Wages before the Civil War were lower than the usual wages when this passage was written. C. Farmers gave away land for free instead of paying wages. D. People who began as factory laborers might later become farmers or businessmen. 7. Choose from the following sentences the one that expresses the same idea as the bolded sentence in paragraph 4. The correct sentence makes the same point, without omitting any necessary details. A. Wages had to be good enough to encourage farming. B. Owning a farm was an excellent source of wages. C. Because owning a farm was an option for workers, factories had to offer competitive wages. D. Factory wages had to be high so laborers would keep from getting soil on their products. D. in the western U.S.
10. What does the author think was the most significant result of the Civil War on American life? 11. Based on paragraph 6, what can you infer the author thinks would happen within a few decades after the Civil War? A. Farmers would no longer need to buy expensive machinery. B. Cheap labor would enable exports to Europe. C. There would be rapid economic development. D. The East would prosper far more than the West. Choose 3 of the sentences below to follow this topic sentence for a summary of the most important ideas in this reading selection. Choose only the three most important ideas expressed in the passage. Do not choose details or ideas that were not expressed in it. Topic sentence of summary: American industrialization and the use of machinery in agriculture increased rapidly in the nineteenth century, especially during and after the Civil War. A. In 1790, after the American Revolution, the U.S. had only about four million people. B. The population increased exponentially, and, aided by the steamboat and railroad, spread over much of the continent. C. Although the whole South grew cotton, some areas would have done better with a variety of different crops instead. D. New England had industrialized, with a big textile industry based on southern-grown cotton-- a major crop due to the cotton gin. E. Factory wages in America were higher than in Britain because free or cheap land enabled American laborers to leave the factories and become farmers. F. Steamboats and railroads made the West accessible. 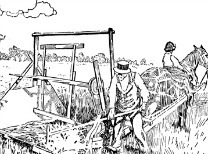 G. The Civil War greatly accelerated the mechanization of agriculture, since reduced manpower forced farmers to use machinery in place of human labor to produce their crops. 2. D. Subsequent means following after, or later in the ‘sequence’ or order of events. 5. C (All the other answers are given in the paragraph. C is not, and in fact is not true. It was the US. government that gave away land or sold it cheaply, to encourage settlement of the near-empty plains. The railroads also sold land cheaply to get more business as farmers shipped their products.) Incidentally, this type of question is quite common on reading tests. 10. D.This is asking what was MOST important-- the main idea of the paragraph. 12. B, D, & G are the best sentences to complete a summary of this reading testpassage and include its most important ideas. A, C, E, & F are all true, and all included in the passage, but they are supporting details. They help tell the story, but are not essential to understanding the author’s main points, as B, D, & G are. For another practice for reading tests, (this one about some mental health therapies) see A Practice Reading Test. home> English Language Test Prep> Practice for the TOEFL and Other Reading Tests.